Spring, so full of expectations. To be alive in spring is to be whirled up into spirals of hope; of unfolding leaves, pending buds, and new beginnings. While waiting for an emerging prospect of my own to unfurl, I have started a new writing project. Busy with that, there is less time to write blog posts, but I don’t want to miss nature’s premier performance, so I slip outside to check on her progress. Well camouflaged in a bush of tiny, shiny new leaves, a speckled song thrush sits resolute on her nest, ‘thinking invisible’. I know she nestles five exquisite blue eggs because I noticed them a few days ago. Nearby, her mate shuffles impatiently along a low tree branch, a cache of worms dangling from his mouth. I’m holding up lunch and she must be hungry, so I tiptoe quickly away. 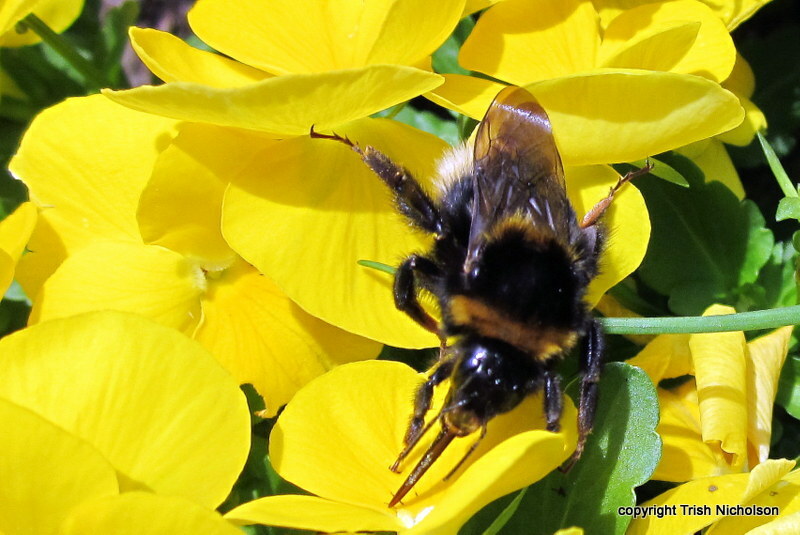 On the veranda, bees forage in a tub of pansies – small native bees but we have bumble bees, too, European stowaways on early settler’s ships – and I grab my camera. 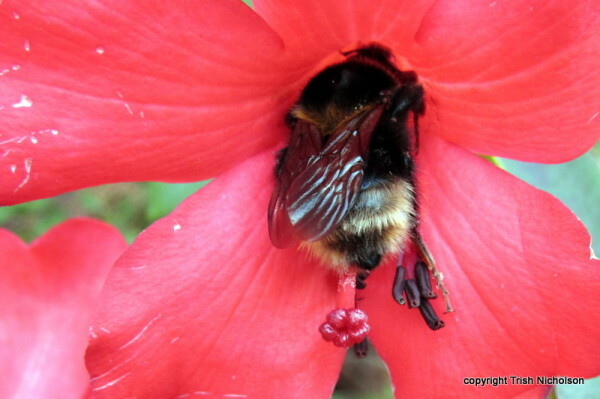 That is not the bee’s tongue that you see, but the hard sheath protecting a long, red furry tongue that unfurls, stretching to 12mm long in the UK species Bombus hortorum. 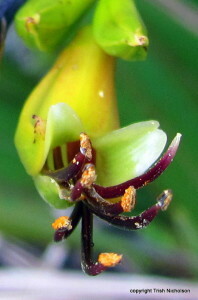 The furry end soaks up the nectar. How do I know that? – Because I discovered this fascinating website > http://www.bumblebee.org where you can learn far more. But now, I must get back to work. Bottoms up! It seemed a good idea to let you share some spring as you move into autumn – glad you enjoyed it. Wonderful post Trish. Your love for nature and your knowledge for it, is just inspiring. Beautiful photos. Great to see you, Joe, and glad you like the photos. I wondered, when I wrote the post, whether you guys up there would enjoy thoughts of spring as winter approaches for you, or whether it would be a depressing contrast. I concluded that it depended whether someone saw a glass half full or half empty. I’m a half full person myself so I went ahead anyway. What lovely photos Trish – just the antidote we need when our gardens are sinking into autumn. Beautiful photos, Trish. Aren’t bees wonderful? We had a bad bee year this year as last winter decimated their numbers, so I missed them. Your images of spring make me dread the winter, but look forward to the new year. Just lovely! I would really love to visit NZ. Lovely to see you Val, Yes, I could watch bees all day. Our native bees are small but when they forage on the manuka (tea tree) they make unsurpassed Manuka Honey. I hope you do visit New Zealand. Our local river, the Awanui, was at one time the main means of transport up here in the Far North, before there were roads. There’s still a couple of small houseboats on it.